The phone rang and rang and rang again. Staggering around the bags strewn around our room I groggily picked up the receiver. A Russian accent on the other end spoke in English: This is Sergei, Oleg’s friend. We have Zaya - where should we bring her? I looked at my watch, it was 4AM. Room 206, I said, and opened the door in anticipation. Fortunately, I’d decided not to follow the crowd to the Russian disco earlier in the evening. I expected that it would be incredibly loud, smokey, and potentially dangerous if one of the Ice Runners showed a bit too much interest in one of the local women. Turns out that I was right on all accounts. Our organizers, Olly and Katy, had hatched a plan to get people thoroughly drunk on Saturday so that they would go to bed early on Sunday and get a clean start Monday morning. It seemed to be working a treat. Practice driving was the order of the day and we headed to a motocross course outside of Irbit. Understanding the Ural’s unique handling characteristics wasn't intuitive. Motorcycles with sidecars pull to the right on acceleration and push to the left on deceleration. That's because ours were one wheel drive and the sidecar was in effect dead weight. Some versions of the Ural drive both the motorcycle and the sidecar's wheels, making them more versatile than tanks. The cruddy conditions dictated caution at every turn. Lots of room. We needed lots of room to maneuver. Eva's dodgy brakes and the snow and ice taught us that downshifting through the gears was the best method of slowing down. The biggest challenge, though, wasn’t navigating the race course, it was climbing the steep hill back towards town. After watching several teams fail, we drew on our Peruvian mototaxi experience from October, pulled out all the stops and successfully crested the slippery slope. We made it back to the hotel just in time for the official launch party. Entertainment for our traditional Russian dinner was provided by a group of very cheery dancers, none of whom could have been younger than 70. 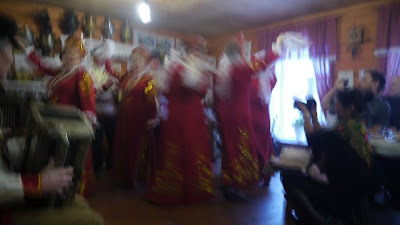 We agreed later that the appropriate collective pronoun for the ensemble was a “flail of Babushkas.” Supper was followed by another Russian tradition, the banya. Essentially a banya is a Finnish sauna, complete with cold plunge and flogging with birch branches, set up on a frozen lake. Despite having brought my swimsuit, I decided that jumping through the ice before warming up in the sauna was a mug’s game. So I watched in amusement as the lad’s ‘nads vanished up behind their kidneys. Sleigh rides complete with cossack hats and a horse riding demonstration by Olly finished the evening and we retired in anticipation of the morning's adventure.